Scrubs (5). Swimwear (50). Swimwear (23). Swimwear (617). Swimwear (1364). If applicable, any protective inner lining must be intact. Material 100% Linen. KNIT BOTTOMS. Man authentic Ralph Lauren casual shirt. Size L. Slim fit. Multicoloured checked. Length of the shirt - 76 cm. Length of the sleeve - 70 cm. 100% Cotton. Waist - 110 cm. 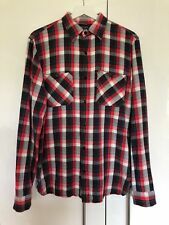 Man authentic Ralph Lauren casual shirt. 100% linen. Length of the shirt - 79 cm. Length of the sleeve - 62 cm. In a perfect condition. Unwanted gift. Waist - 98 cm.